It isn’t something I can, or would, hide. This, on it’s own, seems to be enough to invite all kinds of comments and questions from perfect strangers. Most of them are pleasant enough and polite and I understand. A new baby is an amazing miracle. It doesn’t seem to matter how many people we see who are expecting. Somehow, knowing that a new life is growing, even inside a stranger, fills us with wonder and awe. It certainly is something to be celebrated and enjoyed. These sorts of questions are just fine. I’m quite happy to share the joy and excitement. It’s the follow up questions that start to become problematic. What is it about pregnancy that encourages people to pry? Instead, I smiled again and told her that we were expecting a boy. I always wonder what makes someone ask a question like this. Should I NOT be happy because I have four girls? Should I be EXTRA happy because I have so many girls? I would have been happy if it was a girl and I’m happy that it’s a boy. I’m happy that we’re going to be welcoming this new sweet life to our family. “We are all very excited,” I replied. On our way out of the store that day, she parted with this gem: “Well, at least you finally got a boy!” I have to admit I was grateful she hadn’t said that earlier in the conversation because that thought is always followed with “Are you done having kids now?” and in this case, she didn’t have time to ask. These two ladies both paused for a second and, like the cashier from weeks before, they eyed the four girls with me. I saw them take notice of the big smiles on those sweet little faces and the ladies quickly smiled, too. You see, with that one phrase, I accidentally answered all their follow up questions. That phrase showed our joy and excitement. And it showed that we may or may not be welcoming more children into our family in the future. There were now awkward follow up questions. 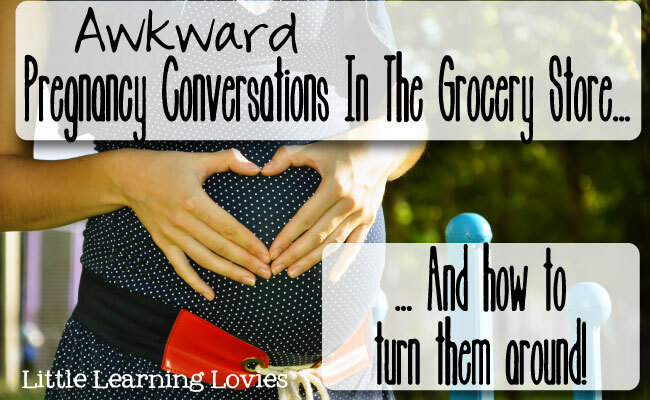 There was no prying or pushing for an odd grocery-store confession. We all just shared a moment of joy and excitement for this new life. Why does this kind of thing always happen to us at the grocery store? I’m not really sure. How have YOU handled awkward conversations like this with strangers? 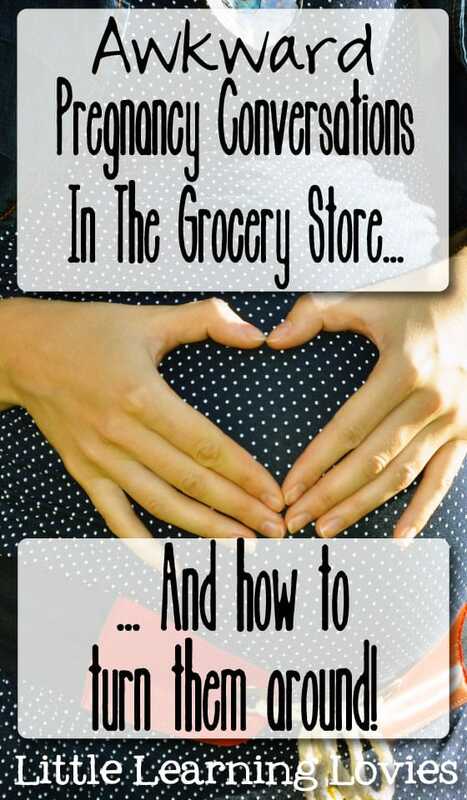 I actually had this very question a few weeks before my son was born and I finally had my fill of it that the last person to ever ask me, is it a boy or a girl, that I replied to this mean old woman who was actually looking into our grocery carts and making comments on the food we ate, and did this every week that we were in the same grocery store at the same time, that I said no, we’re having a male Vulcan. My husbands got black hair and is very logical because his father is Spock from Star Trek so we’re thinking of naming the baby Saurek after his great grandfather. I do admit that it annoys me to no end when people call an unborn baby an it or a thing, they are a real live human being for crying out loud! I think that is a wonderful response! The one I have heard that I don’t really like is, “We’re going to keep going until we get an ugly one.” Well, eventually, you’re going to stop having kids because of nature. Does that make your last one ugly? Or what if you are blessed with a child with a deformity? I think you did a great job, and I’m sure the Holy Spirit was guiding you! I am expecting my seventh daughter, and I have one boy. I think I have only ever had one, very long, conversation with a lady who assumed it was her responsibility to tell us we shouldn’t have any more children. I have never taken offense to any of the other comments. I’m sure if I had mostly boys people would think I should try for more girls. Children are precious and beautiful, and I am happy to share that joy with them. Why take offense? I just tell people we love children! My mother was the youngest of 11, and the 8th girl, so I have a huge extended family. Even in our huge family we have situations of awkward conversations like that. My one cousin now has 3 girls, but her brother and his wife just had their third child, which is a boy. She was asked at our family party at Christmas if she was jealous and going to rush to try for another baby so she can finally have a boy! There is just something about our society that still places high value on male children. Anyway, congrats and good luck with the big day! May labor be short, and the nurses be kind! What a sweet blessing you just bestowed on me! 🙂 Thank you! And isn’t it terrible that sometimes, the odd comments come from family? Much harder to handle than strangers! I have 2 girls and we just welcomed our first little boy in July. I am sad to say that comments about will I try for a boy started before I even birthed my first daughter! It always hurts my heart what kind of message that must send to little girls. When I was pregnant with my son and people asked if we were trying for a boy I answered with “no, we were trying for a baby”, lol! I could write a book on rude comments I recieved, but I feel so blessed with each and every one of my children! Keep up the great work. You're a wonderful example of grace. Dear Rosa, as a mama of eight children, I can say that there is no end to the rudeness of people! I can also say that they honestly have no idea they’re even being rude. When they say, “Are you done yet?” I say, “Children are a blessing and we look forward to how ever many God chooses to bless us with.” When they say, “Are you trying for a boy?” I say, “We’re trying for a baby, so we’re going to get our wish either way!” When they say, “You’ve got your hands full…” I say, “Better full than empty!” (Careful: that one often elicits tearful confessions.) And when they say, “Don’t you have a TV?” I say, “If you think TV is better than s**, you must be doing it wrong.” (I don’t hear that one too often, thankfully!) Occassionally, they even go so far as to ask, “Are you Catholic?” That one still baffles me; we’ve been the largest family in every parish we’ve attended since the fifth child. Being Catholic doesn’t mean large family anymore! Most of the time, strangers don’t mean what it sounds like they mean. My parents almost always go the same thing, so don’t feel bad. I’m the youngest of six and people would ask if we were Catholic and my mom would turn around and say, ” No I’m Jewish, when G-d told us to be fruitful and multiply I took it to heart, as well as my father since I’m the 9th of 12.” They’d more often than not, just bug their eyes out and run along because we are right smack dab in the middle of the Bible Belt. I know even as a small kid I always chuckled at the audacity of complete strangers who think they have the right to say things like that.